Happy Rosh Hashanah and Eid! This year, the Jewish New Year, Rosh Hashanah, will be celebrated at the same time as Eid-ul-Fitr, the Muslim holiday that celebrates the end of the month-long fast of Ramadan. Both are joyful festivals and feasts of celebration. Our family is taking advantage of this nearness to host an interfaith dinner with friends and family to celebrate both. SHANAH TOVA and EID MUBARAK! 1. Hot apple cider, butternut squash soup, pumpkin curry, more apple picking, taking walks with Maya and watching the leaves change, and picking pumpkins from a pumpkin patch are some of the things I'm most looking forward to in October. 2. Sometimes I just want time to myself. 3. John McCain actually did a decent job at the presidential debate tonight, and that's why there is a saying, "never say never"! His policies, however, are still crappy. 4. When I'm down, I pick up a good book. 5. Chasing after Maya is where you'll find me most often. 6. A rainy day is good for reading. 7. And as for the weekend, tonight I’m looking forward to watching the debate, tomorrow my plans include reading Pride and Predjudice and Sunday, I want to spend time with my family that are coming to visit! I first came across Sing Through the Day when I was compiling a list of books related to the Waldorf method of learning. This book of songs comes up on many lists, and I was intrigued. Maya loves music; the songs I have sang to her from birth almost always soothe her when she is upset or having a hard time falling asleep. And I desperately needed to add to my repertoire, I was quickly growing tired of the few songs I knew by heart. The songs in the book (with accompanying scores), are categorized mainly by time of day, morning, playtime, nighttime...with other categories such as weather, birthdays, and games, also included. The book includes a CD of many of the songs. While the quality of the CD is not the best, it does help this musically challenged mama learn the tunes. My years of playing the flute mean that I can read music, but I have a terrible time carrying a tune with my voice, and in that way the CD really helped out. The songs are from all over the world, and many include tips on how to incorporate musical instruments, creative play, and fingerplays with the music. "Proud Missus Sheep, she has a little lamb now, down on Cherry Tree Farm. Hear them together, in any sort of weather, Baaa...Baa...Baaa." (and so on for whatever animals you want to sing about). underneath my roof of yellow singing down the lane. down I bring my roof of yellow for the rain is done. Some of our other favorites are the Swiss Alpine Song, the Thuringian folk tune The Rooster's Our Watchman, and the Finnish tune Sleep, My Duckling. I have probably said this here before, but I am a firm believer in the power of music, and horrible singing voice aside, we spend a lot of our day singing and making music. Maya has learned how to bang rhythm sticks together, and loves eggs shakers and maracas. We recently started Music Together classes, so there is no longer any shortage of new music to sing, clap, and dance along to! First sentence: The day my Uncle Camlach came home, I was just six years old. The Crystal Cave is the first book in Mary Stewart's Merlin Trilogy. It is a series I have been meaning to read for a long time, and when I saw it on the library bookshelves, I snatched it up immediately. Book One takes place when Merlin is just a young lad, the illegitimate son of the daughter of a local king. During his childhood, Britain is divided into tiny kingdoms after the departure of the Romans. The Saxons are a constant threat (as they will be for quite some time), but the land is also divided by internal feuding that takes place before the return of Uther and Ambrosius. We follow Merlin through many of his well known acts: his prophecy of Ambrosius' victory, transporting and building the Giant's Dance (Stonehenge), and the encounter between Uther and Ygraine that led to the birth of Arthur. Most of the Arthurian books I have read are about the women, Mists of Avalon by Marion Zimmer Bradley, and Queen of Camelot by Nancy McKenzie come to mind. It's a nice change to read a book about one of Arthurian legends most mysterious characters, Merlin. The Crystal Cave certainly lives up to the hype, and I'm looking forward to reading the other books in the trilogy. Independent People is the story of Bjartur of Summerhouses, an Icelandic crofter who has bought his own croft after 18 years of servitude to the Bailiff of Myri. Bjartur is conservative, stubborn, and fearful of progress. He is not especially likeable, but you can't help being drawn into his plight. Bjartur prides himself on being an independent man, defining independence as freedom from servitude. However, freedom and independence from starvation, sickness, and extreme poverty are issues he confronts on a daily basis. 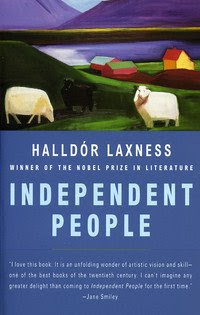 Halldor Laxness won the Nobel Prize in 1955, and many view Independent People as the crown of his achievements. Despite this, it remains an obscure novel--it took months to obtain a copy through the interlibrary loan system--from a small country most Americans know little about. For me, that is part of its charm. The book is hard describe. It is about many things: Icelandic sheep farmers in the early 20th century, self-sufficiency and independence, a satirical look at Bjartur's limitations, the impact of war, and the juxtaposition of economics and politics (particularly socialism vs capitalism), all play out through the course of this epic novel. There are long discussions of ancient Icelandic poetry, for Bjartur is a poet, which really gives the story a timeless quality. Framing these themes is the relationship between Bjartur and his only daughter Asta Sollija. Independent People certainly hold its own in comparison to other works of the time by authors such as Ernest Hemingway, John Steinbeck and Pearl S. Buck. It is a book to read when you have the time to sit down and browse slowly. Wow, it has been 1 1/2 months since my last Sunday Salon post! I love blogging, and reading what my blogging friends are up to, but I found I just needed a break for a while. In retrospect, I think it was the craziness of the last few months finally getting to me: moving, unpacking, adjusting to hubby's new schedule (and the fact that most days he leaves for work before Maya gets up, and returns after she goes to bed), and beginning to chase after my little bub who started crawling, and is now close to walking. isits to a gastroenterologist, and a host of blood work and other tests. Her pediatrician diagnosed her as failure to thrive, "not because I believe she is, but I need a diagnosis number for insurance purposes". In all other ways she is thriving, but seeing FTT on paper just makes me feel ill. So far, all of the test results have come back fine, and my gut feeling is that nothing is wrong medically, especially since she meets all the milestones far in advance. She just isn't all that interested in food. We will be going to a speech pathologist that does feeding therapy, I'm really hoping that helps more than our meeting with a nutritionist, who failed to tell me anything I didn't already know. 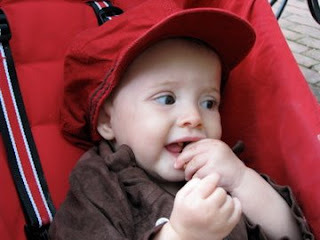 In all other ways, Maya is a happy, healthy 9-month old baby. She has been crawling since June, and currently her favorite activity is cruising around with her Brio walker wagon. In the last few days, she has been briefly standing on her own, so it looks like walking is in our near future! She says a few words now..."ma ma", "da da", and "ne ne" when she wants to nurse. She has also learned the "milk" sign I use to ask her if she wants to nurse. And she has finally learned how to go both up and down a step, so I don't have to worry as much about the step between our living and dining room. And, her toothless grin is almost gone! 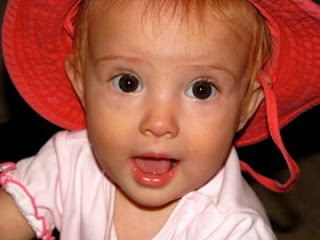 She has two budding lower teeth, with one ready to erupt any day. With all of that going on (how I digress from books! ), I haven't had as much time to read as I usually do. I have finished a few books in the last two months: Independent People by Haldor Laxness, Shopaholic and Baby by Sophie Kinsella, The Crystal Cave by Mary Stewart, You are Your Child's First Teacher by Rahima Baldwin, Sing Through the Day, compiled by Marlys Singer, and House of Leaves by Mark Danielewski. All of those reviews will be forthcoming throughout the next week or two. And now, having finished House of Leaves yesterday, I am having a hard time deciding what to pick up next. I could read Remember Me, by Sophie Kinsella, my mom's book group pick for this month. Although I like Sophie Kinsella, I'm not expecting the book to generate much discussion, and having just read one of the Shopaholic books, I'm not as inclined to pick this one up. I also have The Blue Jay's Dance by Louise Erdrich on my TBR pile, but I don't know if I'm in the right mood for non-fiction. What I really want to read next is the second book in Mary Stewart's Merlin Trilogy...but my hold isn't available at the library yet. More than likely I will be picking up something small and quick, an Agatha Christie or Barbara Pym book, to tide me over until The Hollow Hills is available at the library.